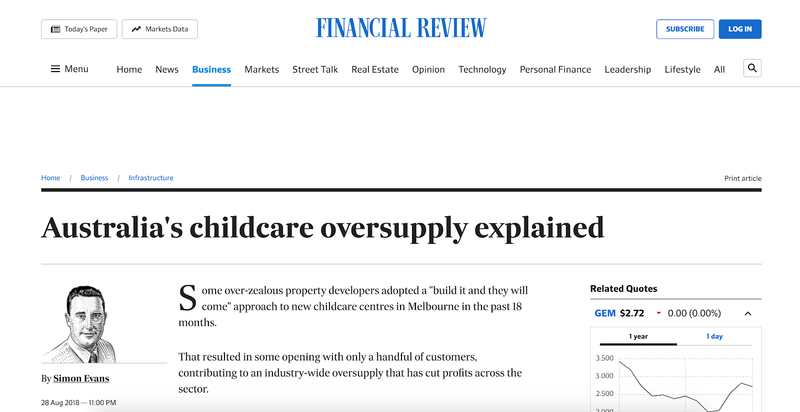 The childcare sector is in a major growth phase. * Flexible working arrangements offered by employers are also enabling parents to stay in the workforce and use childcare services as required. With the number of women in the workforce at a record high, childcare centre revenue has grown by 12% to $12.4 billion (in the year to June 2017). The Federal Government's new Childcare Subsidy is projected to spend $8.8 billion in subsidies this financial year, a figure forecast to rise to $10 billion by 2020. Major international private equity firms and investment banks are signalling confidence in the sector by acquiring large portfolios or taking equity positions. Whilst an increase in places is good news for some families in certain geographic areas, the increase in competition can be devastating to centres in other areas. "Up until two years ago, we were averaging about 12 enquiries every month," Ms Cross said. "We had a big, long waiting list." But enrolments have dwindled. On some days only one baby is cared for in a space designed to take 15. Which if completed, would deliver another 90,000 childcare places. Stockland has begun construction on a $3.7m childcare centre at Baringa on the Sunshine Coast, Queensland. The 132 place centre will be operated by Goodstart Early Learning and opens its doors in January 2019. The revolutionary centre will feature a 952sq m outdoor play space and provide a ground-breaking STEM (science, technology, engineering and mathematics) focused approach to early learning education. In NSW, Archizen Architects, specialists in Childcare Centre Design and Development has 15 new centres in various stages of planning. These include a 101 place centre in Riverstone and a two storey centre in Mt Druitt. Ballarat in Victoria is in the grip of a childcare centre boom with three new child care centres recently opened in mid 2018 with at least two more under construction. In a bid to win over parents, the Ballarat centres are offering cafe areas with barista-style coffee and food, whilst the children are learning new languages, attending yoga sessions and enjoying technology, sports and music classes. G8 Education showed its expansion plans in September when it spent $27 million to purchase Eclipse Early Learning, a Melbourne-based operation with 19 centres across Victoria, NSW and Queensland. 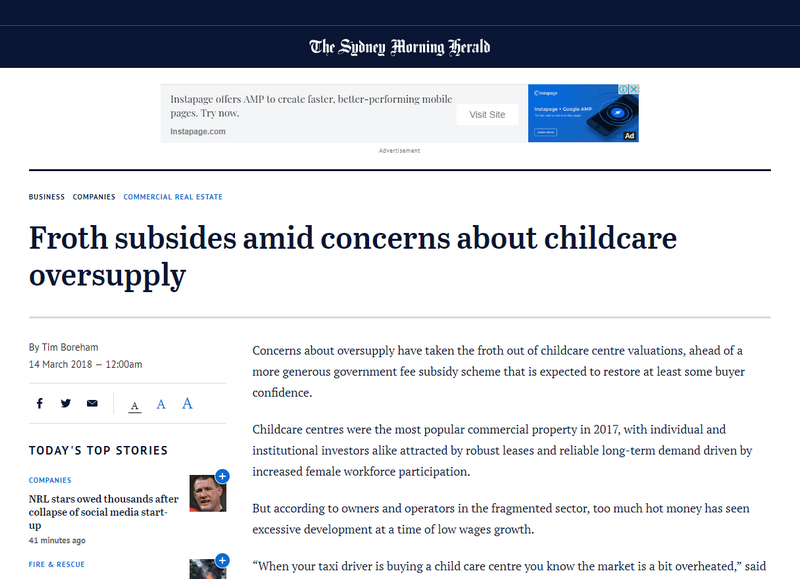 With private equity and big players getting a taste for the security of childcare (strong investment yields and long leasing terms), it’s easy to see how the situation has escalated. We’re dealing with providers who are facing incredible levels of competition. Chatswood, NSW is 12km from Sydney. 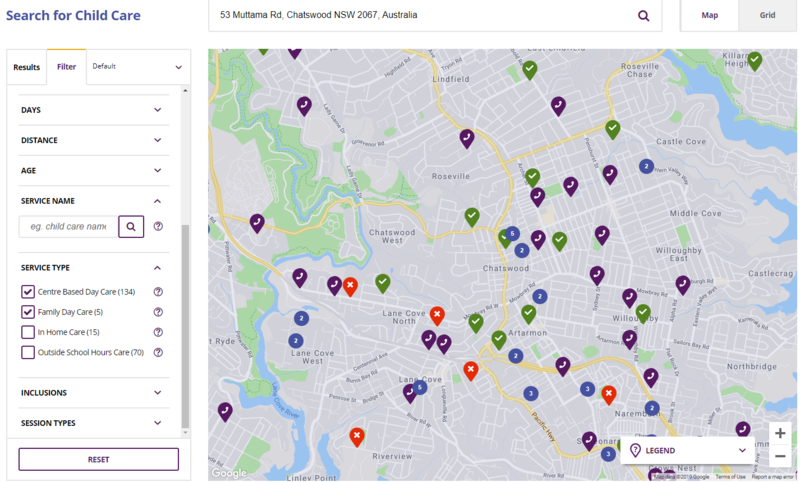 The above chart (taken from childcarefinder.gov.au) indicates over 50 centres within a single competitive zone. 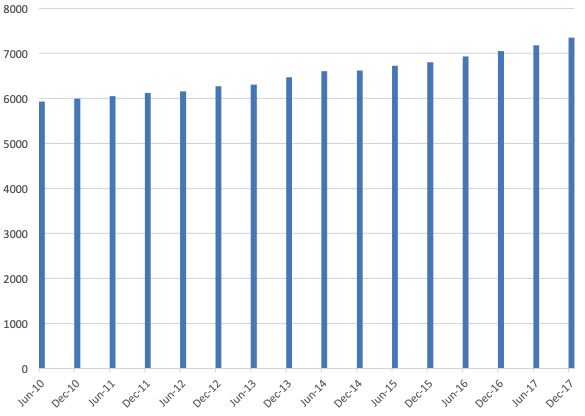 Department of Education data summarises long day care centres in Australia between June 2010 and December 2017. On average, there were 194 new facilities per annum added to the supply network over this period. Note: we are not seeing intense competition in ALL regions across Australia. In fact, there are many regions suffering from an UNDER supply. So if you’re in an over-supplied area, what does that mean for you as a provider? Urban Economics’ recent appraisal of Occupancy and Performance of the Early Childhood Education and Care Sector (on behalf of Australian Childcare Alliance, Australian Community Children’s Services, and ELACCA) published late 2018 reveals the extent of the damage. From the report, occupancy rates derived from the results of the survey of centres summarised by State for 2018 and 2017. If you take the sector rule of thumb that roughly 70% occupancy is a target breakeven point (Source: Occupancy and Performance Appraisal: Early Childhood Education and Care Sector), it would appear that much of the sector is struggling to keep their operations viable. “ACA has been closely monitoring the relationship between low occupancy levels and the oversupply of early learning services in certain geographic areas over the last couple of years.” ACA CEO Mr Mondo said. What does an increase in centres really mean? With families having more options than ever, you can no longer simply build nice facilities, hire great people, and expect a flood of parents knocking on your door each month. Despite this highly competitive environment, at Content First we’ve taken our clients in the childcare space from strength to strength. How did we do it? 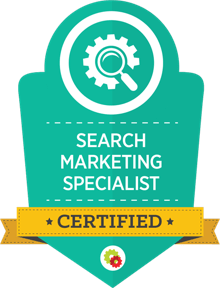 We simply applied many of the best practice digital marketing strategies we knew were already working in other highly competitive industries (like finance, ecommerce and professional services) to their businesses. 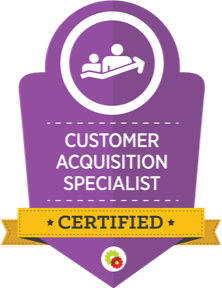 After hitting success time and time again for these child care clients, we decided to develop the framework of our processes that lets us achieve this success. In other words, we mapped out the ‘model’ of the strategy we’re using that keeps beating the competition for our clients. The Parent Value Journey has become our go-to planning framework for assessing how effectively our client’s communication strategy moves parents from being ‘cold prospects’ and not even aware of the business, right through to becoming ‘raving fans’ of the brand. The ultimate goals of the Parent Value Journey are to drive enrolments and support customer retention. In other words, revenue. Taken from the parents perspective, it’s simply how good you are at starting new relationships, nurturing them and growing them into trusted partnerships. 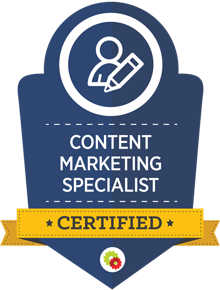 At Content First we’re committed to helping childcare centres succeed despite the tough market conditions. So we developed an interactive guide that walks you through the foundation steps to implement a strategic childcare marketing plan using our parent value journey. So, want to see how well you’re executing across your Parent Value Journey? 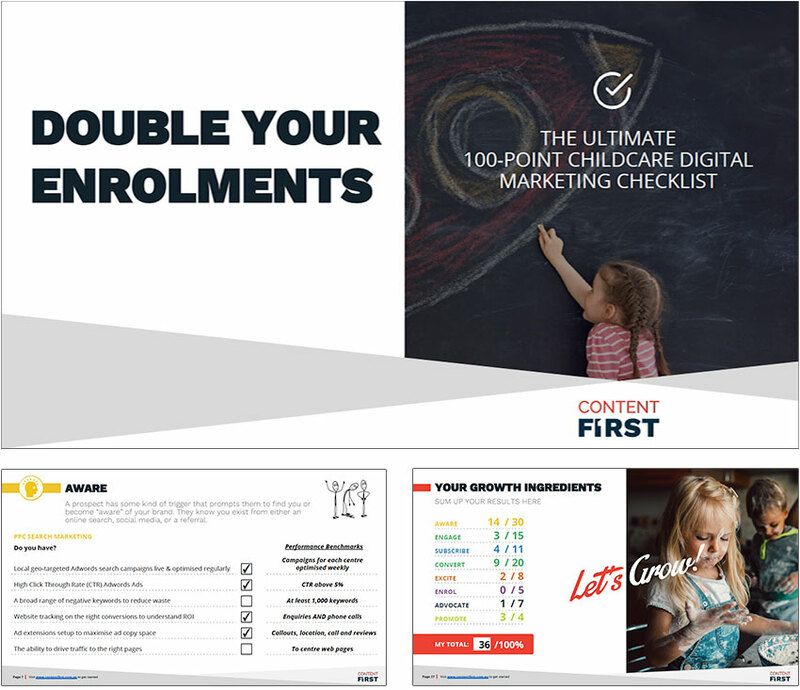 Download the free Double Your Enrolments Checklist, our self-audit PDF tool which scores your digital marketing against best practices across the 8 stages of the Parent Value Journey. 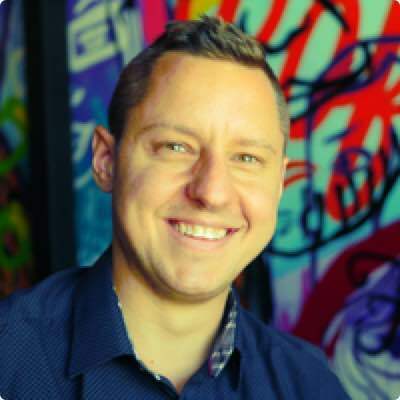 Now you might be thinking “All this is great, optimising my marketing over 8 stages and all my digital marketing channels, but what if I need enrolments NOW?”. It’s usually the first conversation we have with new clients. Which is why we've developed our Enrolment Booster Program. This program is designed to start driving qualified enquiries within 3 weeks. Once we have the enrolment pipeline working effectively, then we move on to lead nurturing and customer retention marketing strategies. Thankfully, growing monthly leads and an enrolment pipeline using digital marketing is surprisingly simple... if you know the formula for growth. We’ve developed a simple formula for growing monthly enquiries and enrolments. It's proven to work for single centre companies, through to 16+ centre organisations. 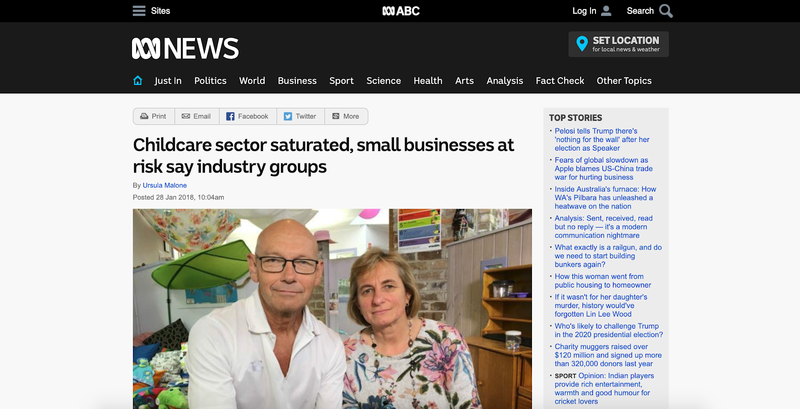 And it's supported by sector benchmarks we've discovered after working with more than 30 childcare centres around Australia. 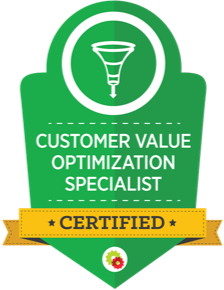 Then using your average monthly revenue value per customer, you can estimate your Return on Investment from the marketing spend (in other words, if you hypothetically spent $1,500 on advertising, you can see you would grow your monthly revenue by $9,000). This gives you confidence to invest and scale your business. Would you like to access a FREE online training session that walks you through these planning tools AND reveals childcare sector digital marketing performance benchmarks (so that you can accurately plan your growth)? For a limited time, we’re offering a FREE online training that walks you through how to use digital marketing to grow your monthly enrolments. If you’d like to go into 2019 with a clear plan on how to grow your childcare business, this is a free training class you absolutely cannot miss.